Glasgow was the venue for the 2015 UKSG Conference and Helen Dobson and I headed north hoping for a repeat of the glorious weather in 2012. We were welcomed by torrential downpours and strong winds, but still had a great time. The UKSG conference is a good opportunity to hear current debate and learn about innovative practice on the issues affecting libraries and scholarly communications, and a valuable forum for meeting publishers. I was lucky enough to win a sponsored place to attend this year – thanks, Springer and Sage! Once again, Open Access (OA) was a key topic so there was much to interest us in the plenary and breakout sessions. We were stimulated by Geoffrey Bilder’s introduction, recognising the pressure to publish facing authors and interested in the notion that universities might get better results from their researchers by measuring less and demanding fewer papers. Bilder commented that ‘the primary motivation [for publishing research] is to get credit for stuff, not to document it or provide evidence’, a situation he described as ‘dispiriting’, comparing citations to ‘a scholarly form of the Like button’. Throughout the conference, Helen and I were keen to attend events addressing issues and problems which we are all facing, including OA workflows, offsetting deals, and how to build trust in new metrics. The University of Manchester Library is already engaging with these issues on a local and national level so we were interested in the experiences and views shared, and particularly in hearing more about longer-term solutions such as JiscMonitor and the experiences of the institutions involved in the Jisc-ARMA ORCID project. One of the most useful breakout sessions was the panel discussion on ‘Engaging researchers on stakeholder perspectives,’ which prompted some lively debate and much follow-up thought and questions. Summarising the recent Research Consulting report on Counting the costs of Open Access, UCL’s Paul Ayris spoke of the high up-front costs faced by institutions until Open Access workflows and tools become more sophisticated, with smaller or less research-intensive institutions bearing a disproportionate cost burden. Robert Kiley provided an update on The Wellcome Trust’s stance on Gold OA, emphasising that the Trust remains happy to fund Article Processing Charges (APCs) but only if publishers will honour agreements. We know from our own experiences that papers we have paid APCs for aren’t always OA or published under licences required by funders. Kiley reported that 34% of Wellcome Trust-funded APCs do not have the required CC-BY licence, and 13% have not been deposited into PubMed Central. This means that £0.5million of OA funding has been spent on papers that are not compliant with Wellcome Trust’s OA policy. Elsevier’s Alicia Wise was also on the panel and explained that the cost of APCs has been reduced for some Elsevier titles. We confess we haven’t really noticed this to date, as the average cost of our Elsevier APCs for 2014-2015 stands at around £1,969, higher than our 2013-2014 non-prepayment deal figure of £1,909. Alicia stated that Elsevier don’t double-dip but explained that it was difficult to evidence this due to confidentiality clauses or to find a cost-based pricing model acceptable to librarians (who favour calculations based on quantity of content) and publishers (who base calculations on journal value). The interactive session on OAWAL, Open Access Workflows in Academic Libraries, offered reassurance that different institutions experience similar problems to those we face. Speakers Graham Stone from Huddersfield and Jill Emery from Portland State emphasised that the principle of OAWAL is to gather a wide range of methods and experiences; not to enforce one ‘right’ approach but to allow librarians to tailor workflows to suit their institution. However, I felt that the group activity of identifying challenges, ideal scenarios and possible solutions suggested that a collective approach can highlight what needs to change around OA to streamline processes The Jisc opeNWorks project we are leading has already highlighted to us the need for community solutions at a regional and national level. As we prepare for the next major challenge of HEFCE compliance, we see that the issues we face are at a scale greater than an individual institution, meaning solutions will be found within the community, not in isolation. 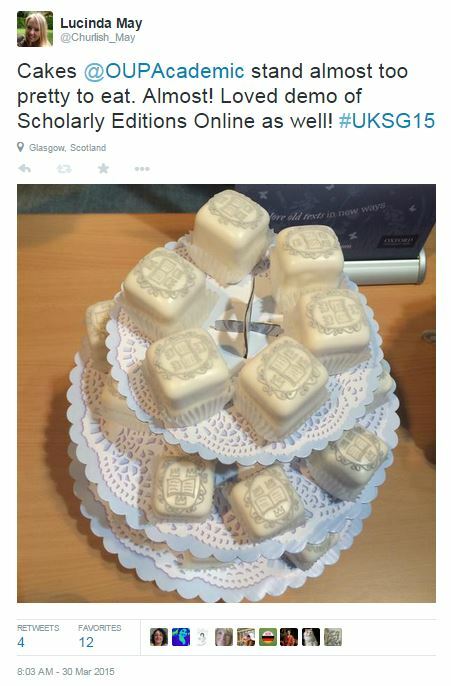 It was useful (and fun – excellent cupcakes, Oxford University Press!) to catch up with publishers with whom we have existing institutional deals, and with whom we may consider arranging a deal in the future, asking questions about how these function and clarifying workflows. We discussed an institutional deal being developed by OUP and saw the pilot dashboard designed to simplify processes for our authors, and we dropped by the Taylor & Francis stand to ask for clarification on how this publisher’s offsetting deal will work for authors. It was also really positive to hear publishers such as BMJ and IEEE considering how they can help institutions with HEFCE requirements, for example, by supporting Jisc’s Publication Router or providing authors with the AAM in acceptance emails; we would love to see more examples of this. The conference ended strongly with its closing talks as engaging as its opening salvo. As always, it was a joy to hear articulate and passionate Open Access advocate Martin Eve speak on how ‘mega journals’ might be funded to address the risk of the Humanities becoming invisible to the public through competition for funding (true of subscription costs as well as APCs) with the Sciences. The University of Manchester Library supports the Open Library of Humanities and we look forward to seeing further development. We left Glasgow reflecting on how far we’ve come in addressing OA challenges at an institutional level to date and feeling excited that we’re involved in tackling remaining problems via the Jisc Pathfinder projects, an RLUK group focusing on publisher OA workflows, and by participating in a UKSG seminar on offsetting schemes in late May. 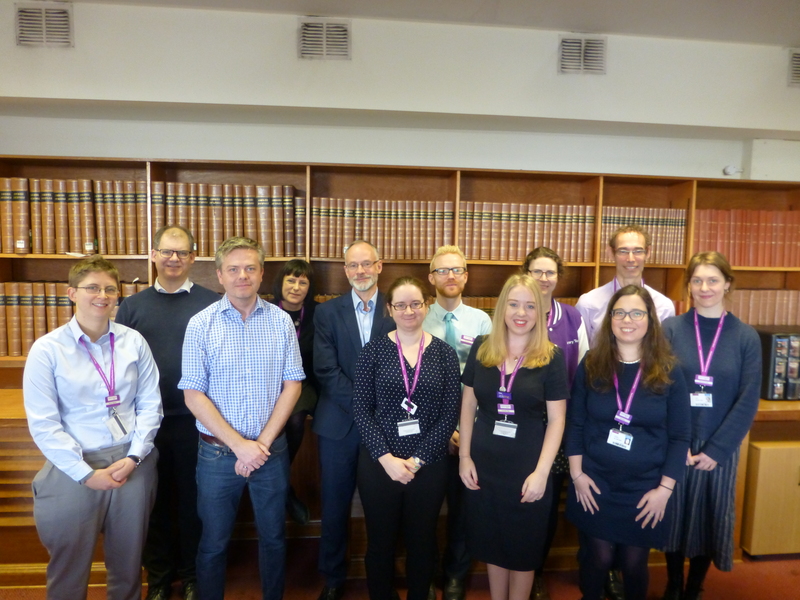 To celebrate International Open Access Week, The University of Manchester Library’s Research Services, Academic Engagement and Marketing teams worked together to deliver a seminar on Open Access (OA) at Manchester. The main aim of the session was to engage with our institution’s researchers. Through a combination of presentations, Q&A sessions and networking opportunities, the seminar brought researchers up to date with what Manchester has achieved with OA; the policies of research funders; progress in OA over the last year; and insight into upcoming developments. The Vice-President for Research and Innovation Professor Luke Georghiou opened proceedings with his own take on Open Access. His research group has published three OA articles in the past year, which have achieved high levels of download; he is convinced this is due to ease of access, and is sure that OA will contribute to future levels of citation. Professor Georghiou thanked the Library for its excellent support. Helen Dobson reflected on the growth of the Library’s OA service, now playing a key role in the University’s OA support. 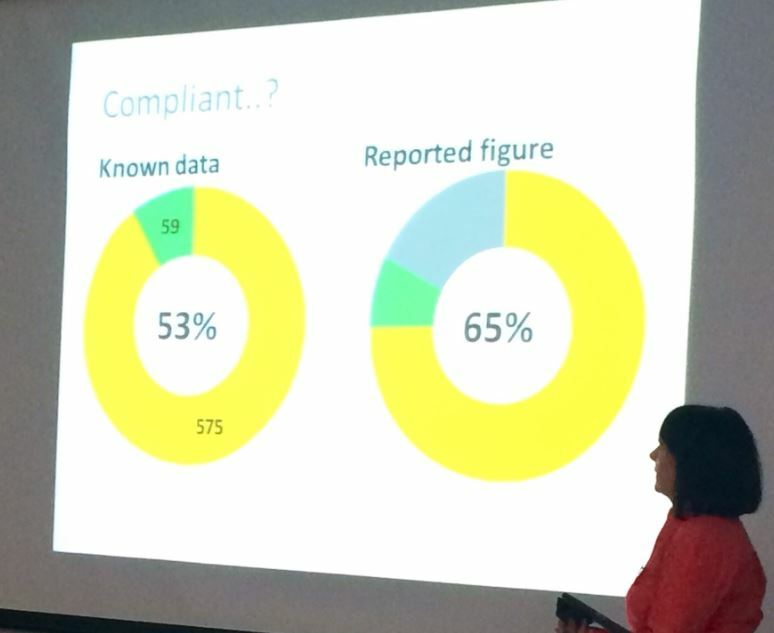 Our work resulted in a 54% compliance rate for RCUK-funded research, an achievement high above the 45% target set by RCUK at the start of the year. Helen discussed the ‘pain points’ encountered by the team, including authors finding the process confusing, or being too busy to arrange OA. These insights help us develop our system and work with other institutions and publishers to streamline procedures. Despite these difficulties, our service has received great feedback and supported over 500 articles in becoming Open Access. Dr Frances Pinter, CEO of Manchester University Press, spoke of the need to find sustainable routes to OA for specialist scholarly books, and make them as accessible as science journals. The not-for-profit pilot Knowledge Unlatched has succeeded in proof of concept. With this model a library consortium paid for a package of e-books to be made fully open, and librarians participated in the selection of content. There has been a high level of downloads. Emma Thompson explained the new ‘game changing’ HEFCE policy. All potential REF outputs must be must be deposited in an institutional repository on acceptance, discoverable immediately, and free to read ASAP. We are encouraging researchers to deposit their Author’s Accepted Manuscripts (AAM) ahead of the compliance start date 1 April 2016, and the Library is working with colleagues in Computer Science to develop an easy interface. Our team will also be administering the new Charities OA Fund (COAF) at Manchester. We have further demonstrated our commitment to innovation, OA and the University’s researchers by announcing the new Library Open Access Fund (LOAF). We want to support authors who do not have funding to cover Article Processing Charges, and have created a pool of funds to support the publication of OA papers. The LOAF pilot will be managed by the Library’s OA team and will be run on a first come, first served basis. If you would like a slice of LOAF, please contact the OA team.